This camera is being mounted in Rhythmbox as a media player rather than in F-spot as a camera. 1. Connect the camera to the computer. 3. Open Rhythmbox not it appears in there under media device however it doesn't show up in Nautilus at all. Last known good version: ? I can reproduce it with a Fuji F100fd. Plugging it in with RB not running: automounts + dialog "You have just inserted a medium with digital photos. [...]". Plugging it in with RB running: no automount, doesn't show up in Nautilus, shows up in RB under "Devices". Starting RB while camera mounted: trying to access it in Nautilus results in a dialog: "The folder contents could not be displayed. 'USB PTP Camera' could not be found. Perhaps it has recently been deleted. ", camera shows up in RB. Starting RB while camera not mounted (but detected by Nautilus): trying to mount it results in a dialog: "Unable to mount USB PTP Camera Error initializing camera: -60: Could not lock the device"
Device 0 (VID=04cb and PID=01e0) is UNKNOWN. Strange, because the camera correctly shows up as "FinePix F100fd" in RB ("USB PTP Camera" in Nautilus). All modern cameras for some reason also appear as MTP devices. I guess libmtp detects this and offers it then in rhythmbox. Not sure how to ignore it there. The USB id is listed in libgphoto2 at least. Ah, thanks. So it's not tagged with ID_MEDIA_PLAYER, so Rhythmbox shouldn't see it unless it's also recognized by libmtp. But libmtp's udev rules do not create a /dev/libmtp* device symlink, so it seem rhythmbox gets confused about this. Could you try if running the mtp-detect command list the device? In my case it does. This mtp-detect looks fine AFAIK. It detects image capabilities (PTP and MTP are very similar), and says that libmtp does not know about this device, which it shouldn't. * Add 05_ignore_ptp_cameras.patch: MTP plugin: Ignore PTP cameras. * Add 06_mtp_memleak.patch: Fix a memory leak in the MTP plugin. 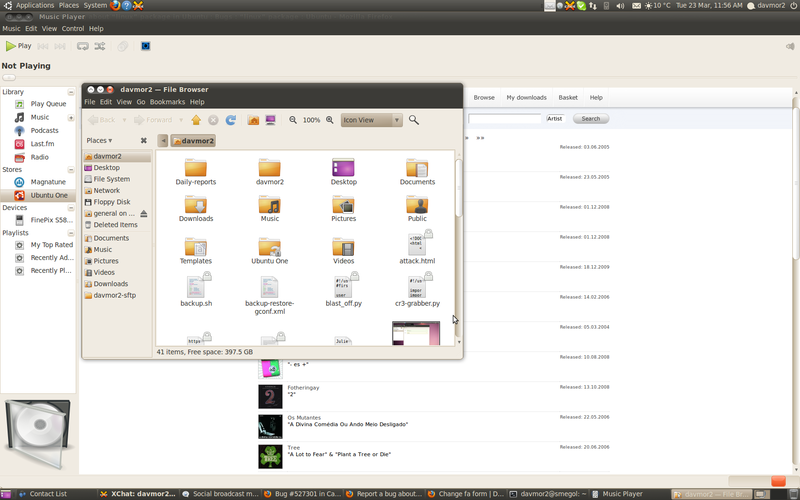 If it was fixed in 0.12.8-0ubuntu2 it's now regressed in 0.12.8-0ubuntu3 on my fresh Lucid upgrade. Rhythmbox gets hung up sleeping (Sl state) as soon as the camera is connected / if it is run with the camera connected. This causes the ever-complained-of "Error mounting location: Error initializing camera: -60: Could not lock the device" from gphoto2 and its consumers. At some point I got a -1 error out of it as well. Of course it's an unexpected race depending whether gphoto2/F-Spot/similar is run before Rhythmbox or not. But with Rhythmbox closed, the device actually works as a PTP camera in F-Spot, much to my relief, and it even gvfs mounts (so turns out I'm not affected by another bug I thought I was). Bus 002 Device 019: ID 040a:05c8 Kodak Co. Bus 001 Device 047: ID 04a9:319a Canon, Inc.
can you please install mtp-tools and give me the output of mtp-detect? Also, can you please do "rhythmbox -D mtp 2>&1 | tee /tmp/rb.log" with the camera attached, let it settle, close it, and attach /tmp/rb.log here? Thanks! fwiw the camera for me doesn't actually show up in rhythmbox, perhaps because of the "didn't match anything" messages. so it would be nice if rb then released its hold on the device. Reopen lucid task per comments 16, 17 and 23. Do you experience the same issue in Maverick ? Thanks for your feedback. I've added a Maverick task to track the regression there too. This is fixed in the current natty version, most probably also in maverick.